Why should you consider us? First and foremost is relationship! It’s about you and your needs that will make our relationship successful. We have the finest, most talented people, with many years of experience. We are committed to taking the worry out of your printing and mailing needs. Wayne has a press to fit all of your sheet-fed printing needs. Our large presses are 5-color presses with coating capabilities. For short-run one- and two-color projects, our Heidelberg Quickmaster press fits the bill. Our wide range of offset equipment ensures that we hit your delivery dates without fail. Our Prepress Department offers complete creative services and output capabilities to either file, proof, computer-to-plate, or digital printing. Utilizing the Apogee front-end workflow system, we optimize the production process from receiving your files to plating. Apogee provides quality control features, allowing us to be your eyes to check for potential errors. Wayne Printing is prepared to process or convert a wide variety of file types, PC or MAC. 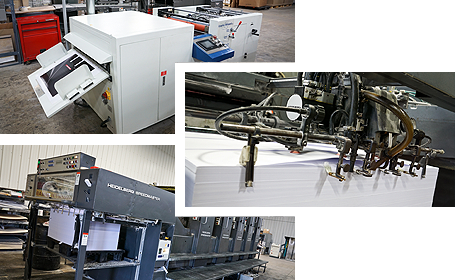 Our pressroom team specializes in producing high-quality offset printing. We are able to complete your project with a quality and cost-efficiency that exceeds your expectations. We have an online fulfillment ordering system that can be tailored to meet the needs of large companies or organizations that have multiple locations, departments, or dealers, allowing a wide variety of products at the click of a button. Inventory management and fulfillment services take the inconvenience out of managing and storing your printed products. If you’re not satisfied, we’re not satisfied. We look forward to the opportunity to create a long-lasting partnership with you. To bring your creative ideas to life contact Wayne Printing today. Call us at 800-841-5333 or click here to request a free quote! We provide printing services to Peoria, Bloomington, Pekin, Galesburg, Moline, and the surrounding areas.